Incoming Kindergartners can be young fives or older fives, each progressing through a range of characteristics that should be considered. When thinking about Kindergarten lessons, keep in mind the typical abilities and characteristics of not only five year olds, but how those needs change as they transition to six. 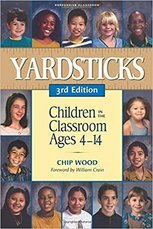 Yardsticks is a fantastic resource that offers age-by-age characteristics of typical child development. These general indicators are helpful to be aware of as you develop curriculum and help children grow. I have included characteristics that I find helpful when thinking specifically about art curriculum, but there is much more included for each age. I highly recommend reading the entire book. Think out loud; will say for example, "I'm going to move the truck!" before doing so.